Today we feature one of the most popular vintage Speedmaster watches with a caliber 321 movement: The Speedmaster Pro reference 145.012. We have featured this specific reference number many times before here, as it was one of the watches that was worn by an Apollo 11 crew member in 1969. Also, as it is one of the most common caliber 321 Speedmaster models, it means you are able to source one without too many problems (and money). 1. the caliber 321 movement (and matching applied Omega logo on the dial). We can’t blame him for that, the column wheel chronograph movement is smooth as silk and has this light click when you operate it. The history of the watch is of course for a lot of owners an important aspect when buying this watch. The Speedmaster is history on the wrist, whether you buy a brand new model or a vintage one. Also, Ashley mentions that he looked at the Speedmaster restoration story that I did in the early 2000s at least ‘500 times’. Ashley likes the caliber 321 movement so much, that he decided to put a transparent caseback on this watch so he is able to have a glance at this wonderful chronograph. In fact, he bought the transparent caseback even before he bought this Speedy Pro pre-Moon ref. 145.012 watch. The caliber 321 movement was used in the Speedmaster collection from the first Speedmaster ref. CK2915 model up to this ref.145.012 model. The last ones have been delivered to Omega retailers up to till 1968. 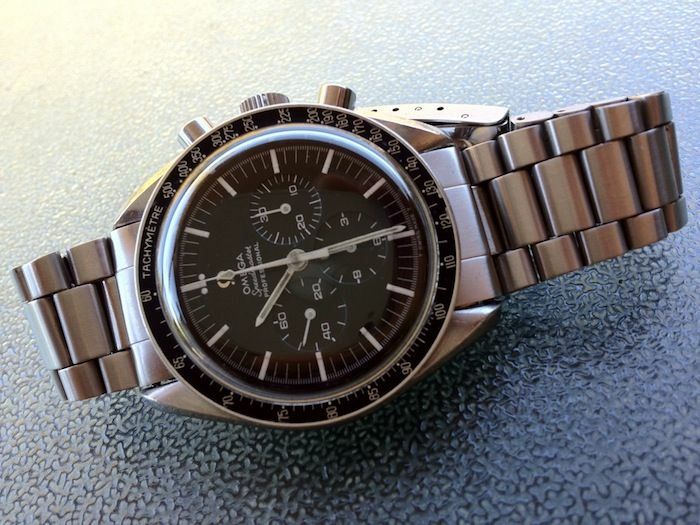 This means that the very last Speedmaster Pro 145.012 were also produced in 1968. In the 4th quarter of that year, Omega started the production and delivery of the Speedmaster Professional ref.145.022 with the successor of the caliber 321, the caliber 861. Note that although some casebacks have 145.012-67 engraved, this only means that the case back has been produced in that year. It might be the case that the watch has been assembled or delivered to retailers later (in 1968). You can find out by requesting an extract of the archives from your watch on the Omega website (click here for the Extract of the Archives information page). 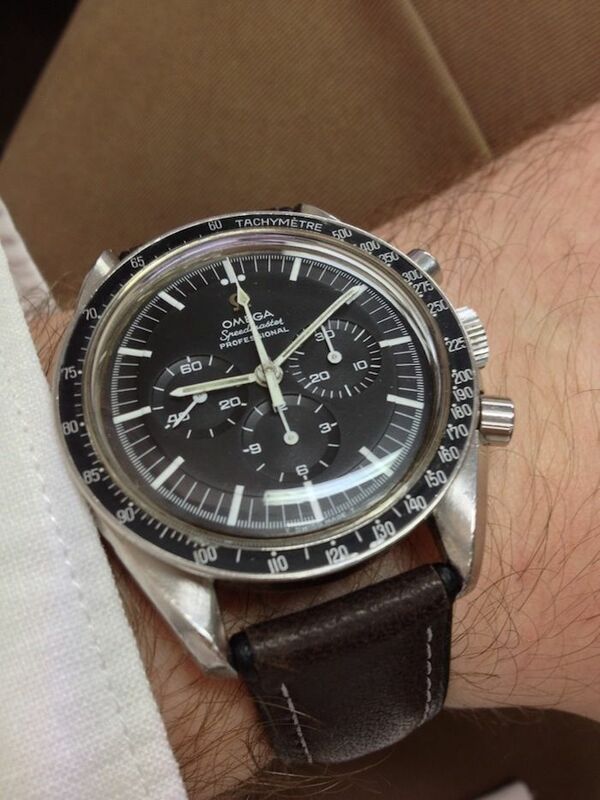 Buying a vintage Speedmaster is not always that easy. 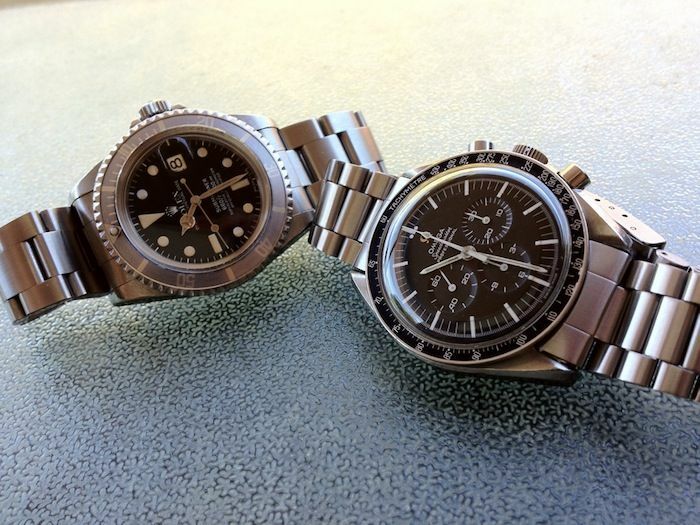 You need to have some knowledge about the Speedmaster-family and be able to identify the correct use of parts on them. 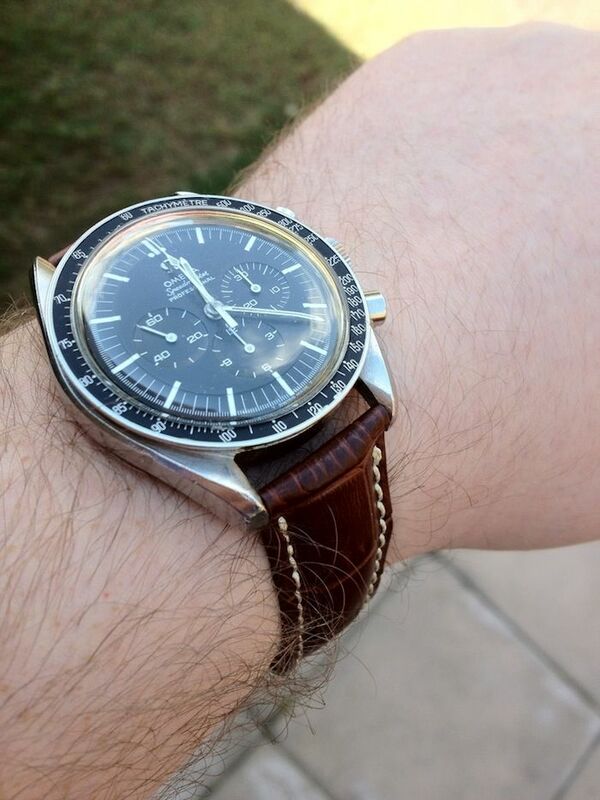 Reading our Speedy Tuesday topic every week will definitely help, but you can also go over to various Omega Forums if you have questions regarding identifying a genuine Speedmaster. Also, a number of books have been written that include Omega Speedmaster watches through the years. This helps to identify the different models and the bezels, dials, hands and bracelets they used. The Omega book ‘A Journey through Time’ is definitely recommended. You can order it here (or click here if you are located in the USA). However, to make it a bit more complex we take this watch from Ashley as an example. Speedy enthusiasts probably recognized the straight-end chronograph second hand on his watch. This might indicated that it has been fitted later, as the caliber 321 watches of this type should have the triangular short-end chronograph second hand. On the other hand, this watch might be from 1968 as well and assembled when the newer type straight-end hand was already on the shelves in the factory in Biel. We have seen similar cases in the past. However, the blue print of this watch is with the triangle at the short-end of the chronograph second hand and that’s what most people use as a guide line. Getting the right parts (like the correct hands or bracelet) can be a difficult task. If you have enough patience, you will probably succeed in the end without (financially) bleeding too much for it. With regards to the bracelet, Ashley’s watch came on this 1171 bracelet with 633 end-links. This bracelet was introduced with the 145.022 model, just like the straight-end chronograph second hand, the caliber 861 movement and the printed white Omega logo on the dial. Ashley has let us know that he really enjoys his Speedmaster Professional ref.145.012 ever since he bought it and likes the fact that it still contains the original bezel inlay with the dot over the ’90’. However, most fun for him is the fact that it has the applied logo on the dial and the wonderful smooth column wheel chronograph movement.